Why a Sunday Coffee post so late in the day, you may be asking yourself….Well, my 18 month old thought it best to get up around 530 today. With getting up earlier than normal also came a cranky and clingy little 18 month old. Then, I thought to myself…I’ll write a quick post during nap. THANKFULLY, he did go right to sleep at nap but I was also exhausted. BUT unfortunately, I could not pass out in 2 minutes like my son. Nope, I laid there thinking of everything I have to do and thinking about how gosh, if I fall asleep now he will be up in 20 min…ugh. So FINALLY, I got up…still no nap for me, and the little stinker is still sleeping…going on 2.5 hours now. GREAT! **Seriously though, it is great he is sleeping he obviously needed it. My child has been throwing us off his game the past few weeks…some days he is up super early, no nap or bad nap, other days he sleeps in good (I’m only talking like to 630 here people), and takes a great nap….hot and cold this one is all of a sudden. Hopefully, it’s just a phase. **Speaking of sleeping….I GUARANTEE the little man will sleep close to 7 tomorrow, which means I’ll have to wake him to get to daycare/work on time (which by the way I HATE waking him up). He only likes to sleep in when mommy and daddy can’t….I’m on to you little man, I’m on to you. **Ok, enough with sleep. HAPPY GRANDPARENTS DAY! 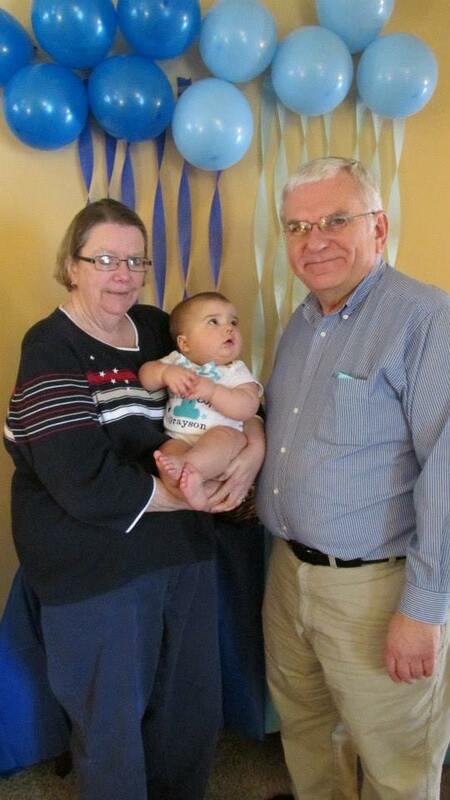 Grayson is blessed to have two wonderful sets of grandparents. Each spoil and love on him whenever they are around him. We are so thankful and lucky to have such wonderful parents!! You guys rock! **Speaking of DVDs….Grayson actually doesn’t watch a lot of TV. We don’t let him…unless he is sick or we need to do something so it keeps him busy we will turn on Netflix kids for 30 min tops. He LOVES Baby Genius…and he LOVES Elmo. But turns out Netflix just got rid of Sesame Street on Netflix…WHAT THE HECK NETFLIX!!!!!? Anyone know what that’s all about and where is a petition for me to sign to get that back?! **We are powering through Dawson’s Creek…STILL! I’ve lost interest…they are now in the college years and I REALLY don’t like when Joey and Pacey aren’t together. But I did find out Netflix is going to be getting rid of Dawson’s Creek in a few weeks too! So power through we will! But, seriously Netflix…get your stuff together. **It has been BEAUTIFUL here in Iowa. I LOVE Fall! And while I wasn’t napping I was thinking how I should be getting out all my Fall decor! I think it’s just big fail all around for me today in the production department! **And one final note to hug and kiss your little ones and loves more and more. A colleague of mine told me a good friend of her’s little girl unexpectedly passed away in her sleep. I CAN’T EVEN IMAGINE! And my thoughts and prayers go out to all the family and friends that knew her. A reminder of how lucky I am….I have a wonderful, happy and healthy family…we are truly blessed and lucky. Now, he is getting up so I’m going to go give him lots of kisses and snuggles! With that, I’ll leave you with a few grandparent photos in celebration of Grandparents Day!!! PS. 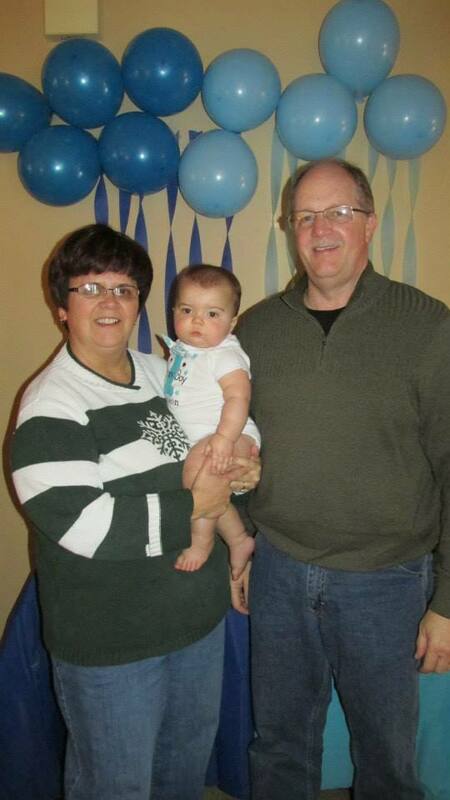 These were taken on Grayson’s 1st birthday….poor little guy had a bit of a cold so was a tad out of it! This entry was posted in Sunday Coffee and tagged grandparents day, Netflix, parenting, sleep regression, toddler by Life As We Know It. Bookmark the permalink.